Mommy Maestra: Mommy Maestra Challenge: Operation Organize It! I mentioned in my resolution post for 2011 that one of the things I'd like to do is get rid of clutter and be more organized. The urge to clean has been roaring inside me since the beginning of the year, and sporadically, I have been giving in to it. I come from a long line of clean, organized women. My great grandmother on my mother's side was an extraordinary chef and housekeeper. She was happiest taking care of her home and the people in it. The mere wiff of Pine Sol will instantly take me back 25 years or so (ahem) to her home. She was your typical abuelita, pleasantly plump with a giant smile on her face and her silver hair pulled back into a bun. She almost aways had an apron tied around her waist because if she wasn't cleaning, she was cooking mouth-watering dishes. Almost all the women on my father's side of the family are cleaning divas. Their homes sparkle and shine. And often, when I fly to Spain for a visit, I leave in awe of what seems like their boundless energy and organizational ingenuity. Anyway, I think that having a clean house is something with which many mothers struggle...especially those of us who homeschool. Why? Because quite simply we are spending a greater portion of our time in our homes. But I know that having a clean, organized home is not something that is unattainable. We can do it...it just takes us a little longer, and sometimes it requires a little more creativity or determination on our part. 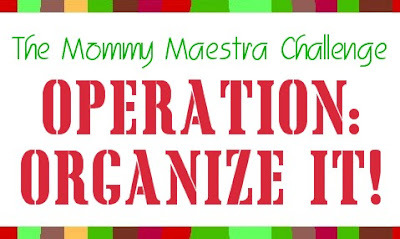 So in keeping with my resolutions for this year, I am creating the Mommy Maestra Challenge: Operation Organize It! Each week or two, I will tackle a different area of my home, weed out the expendible items, and organize the rest. While this is mainly a guideline for myself, I am sharing it with you so that if any of you want to follow along or share your own accomplishments, you can! I need a lot of motivation. And blogging about this goal will help hold me accountable. I would love for you to share any tips you may have for organizing your home - especially your homeschooling tools and lessons. If you follow me on Facebook, you will already see that I have jumped in to this challenge with both feet. I hope to meet you along the way! The cabinets under the kitchen sink. To quote my friend, Liz: What the maracas is under there anyway? Mostly a giant mess. My cookie sheets and baking pans are falling all over the place, my pots and pans are a disgrace, cookie cutters are doing the salsa, and my plastic recycling tub is overflowing, belching out yogurt tubs and who knows what else. Time to regain some order.